A string quartet is an ensemble of four stringed instruments: two violins, a viola, and a cello. Our collection includes classical, romantic, waltzes, ragtime, love songs, movie, broadway and jazz tunes. The quartet will provide the perfect musical environment for your special event. How can we use classical music in our event? WEDDING CEREMONY – Whether the traditional “Here Comes the Bride”, the equally beautiful “Pachelbel Canon”, or some other selection, the sound of strings will enrich the event with an atmosphere of elegance and sophistication. COCKTAIL RECEPTION / HORS D’OEUVRES – Light Classics are best, so the music does not demand too much attention, but creates a beautiful background. DINNER – We recommend Baroque and early Classical (Bach, Vivaldi, Mozart), after all many of these pieces were written specifically for these occasions. HOLIDAY PARTIES – “Nutcracker” favorites, Christmas carols, and/or popular tunes evoke the holiday spirit. Where is music appropriate during the wedding ceremony? Listed below are some traditional moments in which the string quartet can be included in wedding ceremonies. Please reveiw our Repretoire List page for a full list of the music we perform and an example playlist for your special day! What are some songs you recommend for a wedding ceremony? Below are suggestions for commonly performed string quartet wedding pieces for each part of your wedding ceremony. Please feel free to make changes you see necessary or contact us for other suggestions. Keep in mind, arrangements of your favorite songs may be accommodated. Please review our services and fees for arrangment infomation. As guests arrive and are seated, the Haase Quartet will perform a selection of appropriate pieces. If you wish to have specific song selections made for the prelude, please choose from our repertoire list or sample wedding list we have made for you below. Please listen to us as you make your song selections. As guests continue to exit the ceremony, the Haase Quartet will continue to provide a variety of song selections for their enjoyment. If you would like to have a specific song played please choose from our music repertoire list. My favorite piece is the ”Home on the Range ”. Can the quartet play this for my processional? We will indeed make every attempt to honor our clients’ special requests. If the piece is not in our repertoire, we will look for a string arrangement. Unfortunately, some pieces are just not arranged for string quartet. How do I select music especially if I don’t know much about music? No matter how much or how little you know, your personal taste is very important in deciding what music you want played at each point in your wedding celebration. First, think about the mood and tone you want to set: festive and elevating, quiet and reflective, or a combination of each as the celebration unfolds. Look through The Haase String Quartet repertoire page for ideas. Listen to recordings of suggested wedding music. Pay special attention to the music at the next wedding you go to. Contact us and we will be happy to work directly with you to select music that has special meaning for you. The Haase String Quartet’s repertoire is extensive and varied with music from Baroque to contemporary love songs, and everything in between. Will there be any travel expenses? A travel fee of $25 per musician is applied when the total distance traveled exceed 50 miles roundtrip. The starting point is always the Fairfax Old Town Hall, in the center of Fairfax. This means that any destination 25 miles or more from this point will be charged the travel fee. Can the quartet attend my wedding rehearsal? We have found that attending the rehearsal is unnecessary. Generally, we perform for weddings without attending the rehearsal. However, if you feel it necessary, we can attend the rehearsal for a fee. Please see “Services and Fees” for additional information. Your event is special, and the quartet will dress appropriately for the occasion. 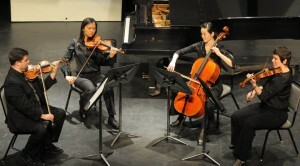 The typical attire for the quartet is formal black. What kind of equipment and set up is required? The quartet requires four chairs with flat seats and no arms. If you wish to have the quartet move to another location during your event, a set of chairs should be provided at the new location as well. If the event is outdoors, shady cover must be set up to provide protections for the instruments from moisture, direct sunlight and temperature extremes. The quartet should be notified in advance if the event is indoors with poor lighting and a close by power outlet is needed for stand light. How far in advance should I hire? Contact us as soon as you have the date and location set. Our calendar quickly fills up months in advance, so reserve early to ensure availability. If you have other questions, feel free to fill out our contact quartet form or email us at haasequartet@gmail.com. We would be happy to answer your questions and provide you with information as you plan and prepare for your special occasion.